Got candles??? Make some of these beautiful shell candles and add a summer glow to your table any time of year! I’ll just give you a quick how-to on creating these and then you’ll be making candles out of every shell, tea cup or old tin you find around the house. It’s such a simple project that you can make a million of them in a day…well, almost. I really like the way soy wax melts so I always use it whenever I’m making candles. A little goes a long way and you’ll want to plan on making a ton of candles or having some supplies for later. 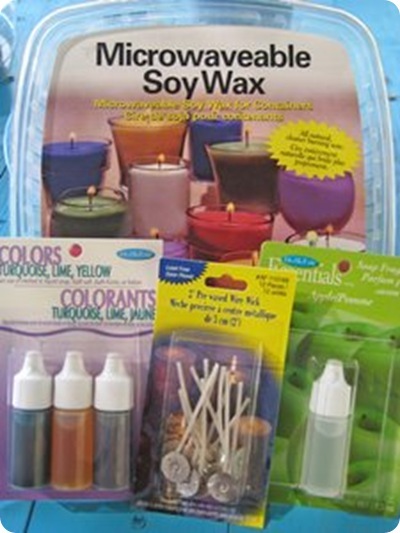 The fragrance and dye can be used in soap making on another creative day. Find and clean a large shell. Prop your shell up in a dish towel to hold it level. Stir a drop or two of color and fragrance into your wax. Hold a wick in the center of the shell as you slowly pour in your wax to the desired level. Let it cool and your done! Tips: I use just a little yellow to give it a slight color like the inside of a shell. I burn these candles with other shells around the base to hold them up straight while they are burning. Sand in a beautiful glass dish would work perfectly. Cut the wick a little shorter before burning to keep from having a large flame. These would be wonderful for a dinner party on the porch! The shell itself lights up so nice! Oh, and while you’re making them you can bundle up a few for gifts later on in the year. Everyone loves shells! 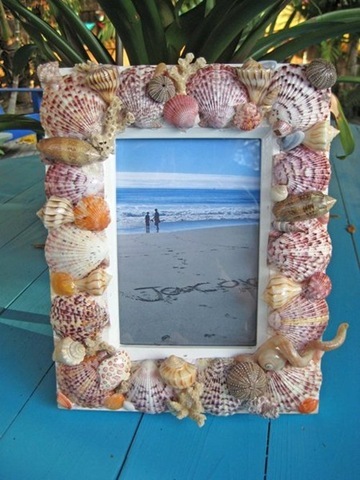 If you have a bunch of shells left you might want to make a shell frame! How cute these candles are! And it brings me to the beach in my mind, even though I’m landlocked right now. .-= Debbie´s last blog ..Blessings Keep on Coming =-. i use to make super thin ceramic forms that would glow with a tea light in them… i should have just created my own candles. .-= megan´s last blog ..Custom Order Deposit or Gift Certificate One to Two items. =-. I have a shell frame I made years ago, but no candles!! I am a candle freak, so now I am going try the tutorial out!! THANKS!! .-= Michele´s last blog ..Fabulous Friday! =-. 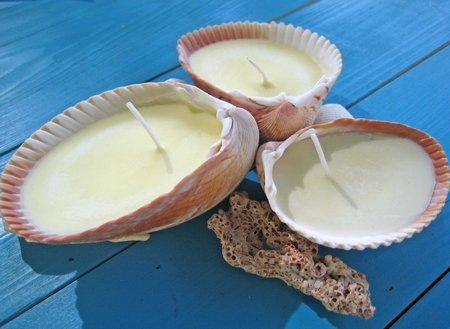 Love the shell candles! Thanks. .-= LeAnn´s last blog ..Picnic Time =-. Wonderful idea! I love shells, too! Thanks! Love the seashell candles. Those are a must to try! .-= Beth´s last blog ..Comment on New Jewelry Coming Soon! by Yvonne =-. These are SO cute! love the idea. Can’t wait to make them. And thinking if I add a little citronella oil they will keep the bugs away while we are on the deck. .-= erin pickering´s last blog ..Inspiration Monday – Hydrangeas =-. very pretty looking neat candles! Simple and yet classic. Luxury candles or shell candles they are such happy things! Thanks for sharing this lovely creation. Neat idea!! I wonder if one can by special candle wax that burns slower than normal…?